I'm so glad we the taxpayers pay on NYE/NYD to carry the hoardes forum members around! Maybe I should state I was actually on my way home from a evening out and not randomly riding around LOL. I trust my comments were taken in jest as intended. 10184 on the 269. Remarkably it sounds as though the gearbox is well worn & awaiting death. I had 751 on the 358 this morning after 515 had a slight issue at Orpington Station. WVL391 blinded for the 12 to Oxford Circus whilst running light from Newington Green to NX. DPS2, the bus intended for route 385 was destroyed in a fire last july; As i found out a few days ago on another group. So i assume the 385 uses anything spare and suitable. Good observation, i take it the bus was fully blinded?! Yeah, it had full WOB blinds - it was the first time I saw the 385 in person lol. Thanks for the info. 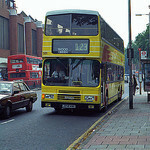 Route 385 was originally operated by First at Northumberland Park, following the reformation and cessation of operation of mobility routes 903 (Walthamstow - Whitechapel) and 905 (Walthamstow - Chingford Station), the 385 replaced the northern section of the 385, albeit doesn't run between Walthamstow and Crooked Billet. The 385 was won by CT Plus with an existing bus, the now withdrawn DPS2 from HK on the 16/10/10 it was in Tranche 326; it runs Monday to Saturday shopping hours between 09:30-16:20 at a frequency of every 70 minutes. It seems that CT Plus put out anything on it that is small enough to get round the residential side roads off Valley Side. I sometimes see it when I go to Sainsburys. It's the classic "granny's shopping bus" route with fairly low ridership but it does serve bits of Chingford that are remote from other bus routes without a long walk or a trek up steep hills. I've ridden the route twice but only did the full route on the second occasion - amazingly it picked up a fair number of people on Kings Head Hill even though that road has the 313 and 379 running on it.